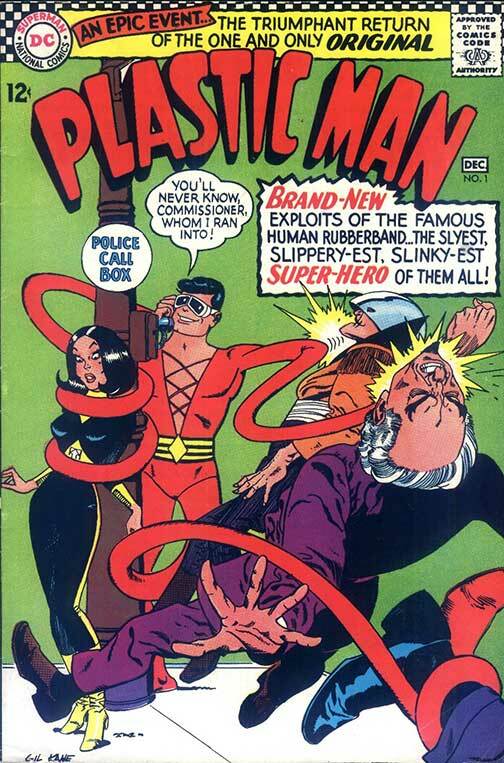 It seems there's a lot of people who would wish harm upon happy-go-lucky Plastic Man! Super villains like Dr Dome and Professor X! The elitist (and extremely rich) Mrs DeLute and her butler Fawnish! The arrogant (and inept) police Captain McSniffe! And the conflicted daughter of Dr Dome, Lynx, who both loves our Stretchable Slacker and continually tries to kill him! With this set-up in place, the title ran nine more issues. Arnold Drake would remain as writer for the entire series. Win Mortimer would take over interior art from 2-7, with Jack Sparling finishing the series from 7-10. 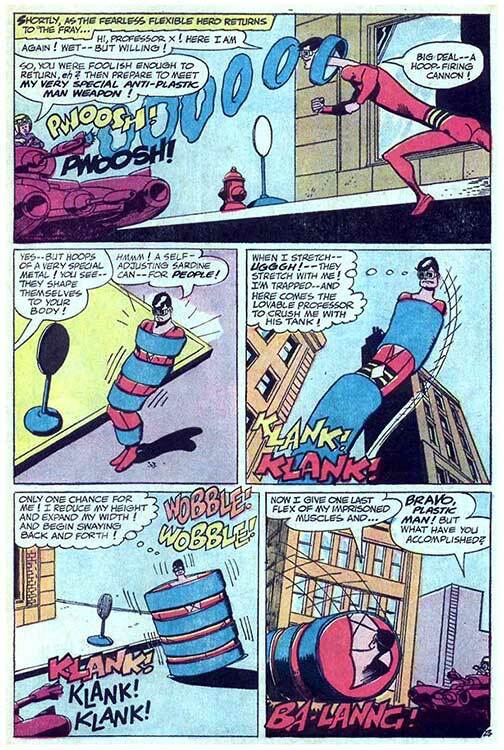 Carmine Infantino and Joe Orlando would contribute covers. 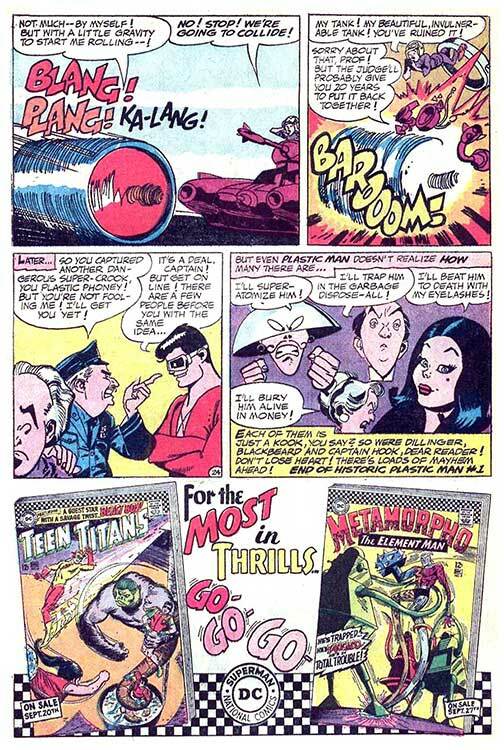 This being the 1960s, Plas would battle both mod-dressed characters and gorillas! 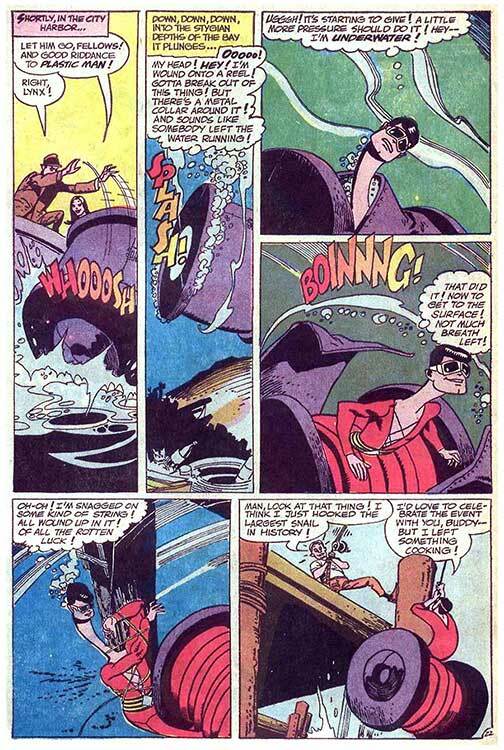 After an issue presenting three different origin tales, Plas' pliable pappy, the Golden Age (Quality Comics) Plastic Man appeared along with sidekick Woozy Winks! There was a campy cross-over with Batman in Brave and Bold. 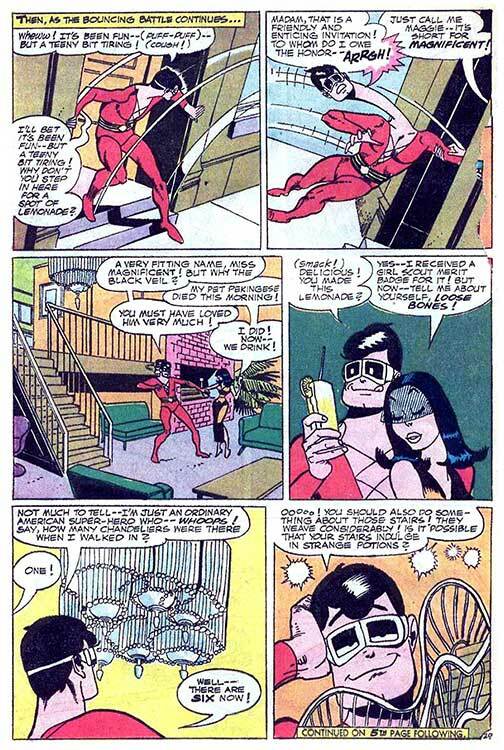 Then he disappeared for several years before being revived as an amnesiac involved in a romance with a villainess. 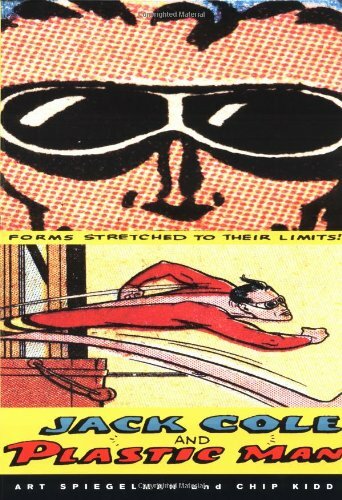 Speaking of stories, I believed this tale had never been reprinted, but it appeared in DC's Plastic Man 80-Page Giant (2004), which reprinted several of Plas' "famous firsts". 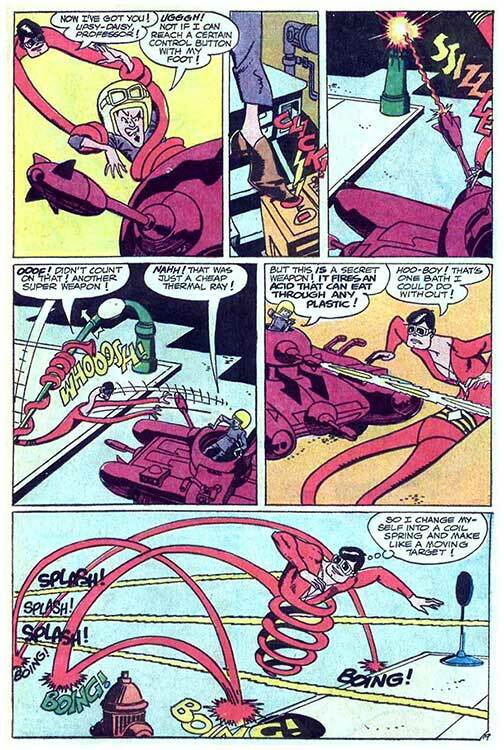 The Silver and Bronze Age attempts to revive Plastic Man in his own self-titled comic each lasted ten issues. 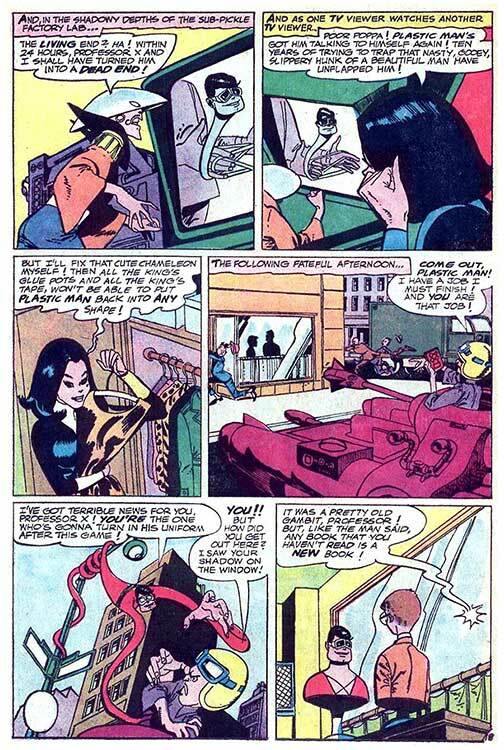 There was also a PM strip that ran as a secondary feature in Adventure Comics circa 1980. And, as you say, occasional co-starring appearances in Brave & Bold. 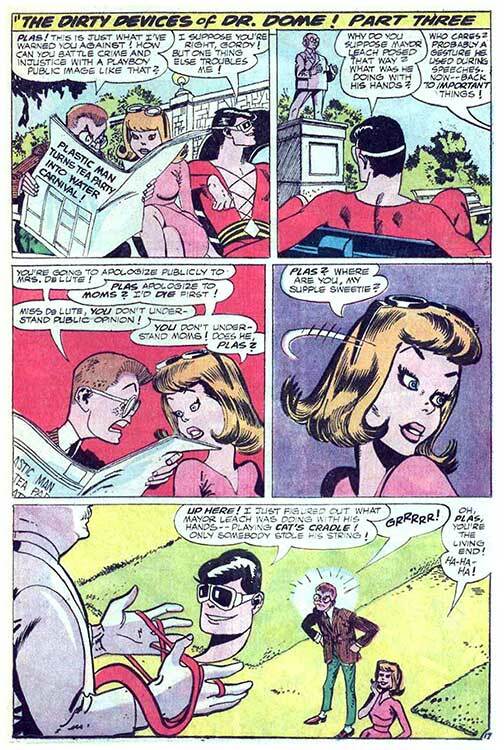 In a way, I would have expected both Plastic Man and Inferior Five to be more popular in the mid-1960's. They fit in with the camp comedy and pop art fads of that time. But most comic book readers were kids, who wanted their superheroes played straight. And adults would watch tongue-in-cheek action-adventure in other media (James Bond, Derek Flint, and Matt Helm in movies, and Batman, The Man From U.N.C.L.E., and The Wild Wild West on TV), but they did not read comics.